Before hiding "Easter Eggs" in superhero movies became commonplace, horror movie practitioners have elevated the practice to an artform, inspiring genre aficionados to scrutinize films and trailers pixel-by-pixel. In his breakthrough, Halloween-themed anthology Trick 'r Treat, for example, filmmaker Michael Dougherty designed the cantankerous recluse Mr. Kreeg (played by Brian Cox) to look like Master of Horror John Carpenter. Dougherty's current project is Godzilla: King of the Monsters and, as expected, he's at it again, embedding shout-outs to his inspirations-and Carpenter is again featured prominently. Eagle-eyed fans watching the Godzilla Comic-Con trailer were quick to note that the frozen body of King Ghidorah, encased in glacial ice, is extremely reminiscent of the hibernating alien discovered in 1982's The Thing. The research facility set up to study this monstrosity looks more than a bit like Outpost 31, the Arctic location where Carpenter's film is set. Much less obvious (though just as ominous) is a reference to the king of all horror movies: The Exorcist. During a scene of apocalyptic destruction at a decimated temple (pause at the 1:50 mark in the trailer) you can see a familiar statue on the far right. It's an exact match for the statue of Pazuzu that Father Merrin (played by Max von Sydow) sees unearthed at an Iraqi archeological site in the opening scene of William Friedkin's incomparable chiller. 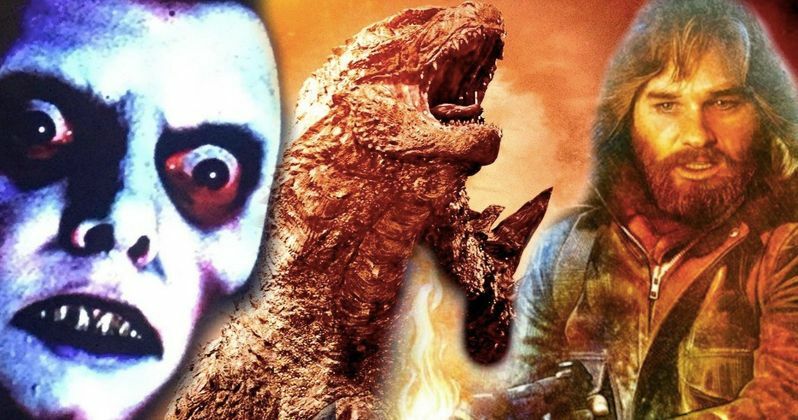 While The Thing Easter Eggs are fitting for a tale of giant, earth-shaking monstrosities, alluding to The Exorcist adds an air of paranormal mystique not usually seen in Kaiju films. It'll be interesting if, as a horror practitioner, Dougherty brings additional supernatural elements into this arena. While it's hardly an Easter Egg, Dougherty also tugs at the wounds of history with imagery reminiscent of 9/11, specifically the opening sequence where Millie Bobby Brown sees a pulsating dust storm envelope a cityscape. The implication of mighty cities falling beneath nefarious, unforeseen forces has been utilized in a bevy of modern creature features, from 2008's Cloverfield to this year's Pacific Rim: Uprising and many others in between. Other less significant revelations noted in the trailer include the fact that Godzilla and company are no longer referred to as MUTOs (an acronym for Massive Unidentified Terrestrial Organisms). In a narration from Vera Farmiga, we're told these beasts are now known as "Titans". It's a subtle bit of retcon that gives the beasts a deeper mythological resonance, likening the film's antagonists to The Kraken and other monstrosities of ancient Greek and Roman lore. Titans were also sub-deities, endowed with powers that go beyond the pale of human comprehension. Perhaps the most amusing, and least relevant observation made since the trailer for Godzilla: King of the Monsters was unleashed on enthusiastic crowds at Comic-Con is that the titular Kaiju looks fat. What's up with the body shaming, people? Godzilla: King of the Monsters hits US Theaters on May 31st, 2019 and stars Bradley Whitford, Millie Bobby Brown, and Vera Farmiga. This news first appeared on Coming Soon.